SAPHIR? 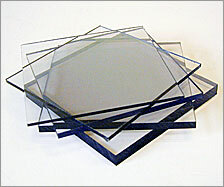 is a hard coated extruded polycarbonate sheet, glass like in appearance and scratch resistance. In SAPHIR?we have combined high impact strength with the additional qualities of: improved weather and chemical resistance as well as high protection against abrasion. This is possible due to a two-sided coating made of hard silicon, which is known as the very best on the market. The high impact strength of SAPHIR? is maintained even in extreme temperatures.
? Excellent combination with COLORADO? Applications in safety glazing, thanks to the improved scratch resistance and the high impact strength. The hard coating is resistant to many chemicals, which is important for applications within the machine industry. SAPHIR? is virtually unbreakable, does not splinter and is therefore suitable as machine protection. and can be easily removed with detergents. An example of an application in the combination SAPHIR? and COLORADO? is tractor roofing with green tint. SAPHIR? can only be used for flat constructions and Arla can not be responsible for any kind of formed applications. All colours (as SAPHIR? COLORADO? ).